Anna Bezzola, a Swiss national, has been hopping around between Italy and Switzerland since she was born. Naturally, her playground, from the moment she started to walk, were the Alps. With her father as a mentor, she spent her summers exploring and getting to know the territory. Her love for travel emerged very early in life, with regular escapades throughout Europe. It was not long, though, before she moved to the United States, where she worked for many years with one of the leading adventure travel companies in the country, guiding and learning the tools of the trade necessary to start her own company in Switzerland, where she returned in 2002. She has organized and operated many walking and hiking tours, since then. Anna is multilingual, has a keen sense of curiosity, and loves to study the history, culture and traditions of the most disparate places. 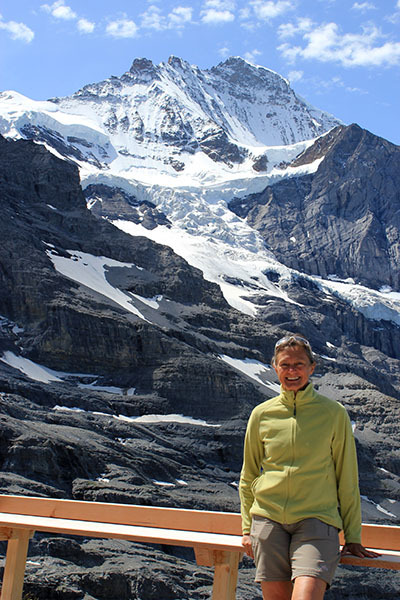 She regularly guides most of Alps and Beyond’s walking and hiking tours in Switzerland and Italy. She is a hiking and environmental guide, an official guide for the Castles of Bellinzona and the paleontological site of Monte San Giorgio, two UNESCO World Heritage Sites in Ticino, the Italian-speaking region of Switzerland. She is a member of the Swiss Tour Guide Association. Amongst other places, her travels have taken her to Patagonia, Uruguay, Thailand, Bhutan, Alaska, the Arctic and the Antarctic.